- What is happening in the area? - What to do on your vacation? - Are there some exiting places for sightseeing? Read traveltips, newspapers and some news from Estepona and Costa del Sol. Click to read more. Some external links. Midsummer celebration on the beach in Estepona. Playa El Christo. Watch everyone swim in the sea at midnight. One of the most spectacular walkways in the world. 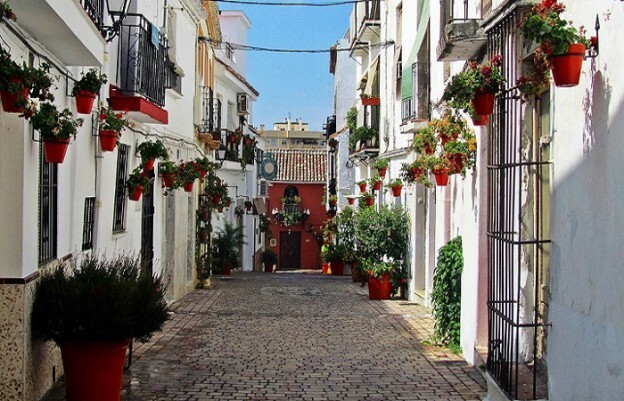 Information about Andalucia, Estepona and the area around. A trip to Bano Romano not far from our villa. A day at the spa. An old Roman bath with sulfur water in natural surroundings. Norwegian newspaper with news from Spain. Covers Alicante and Costa Blanca area, but have also some news from Costa del Sol. English paper with spanish news directed to expats in Spain. An activity calendar from the municipality. See what is going on in Estepona. The free newspaper is also online. Covers Costa del Sol with news, articles and ads. Delicious ripe oranges can be picked from our trees during the season. The worlds greatest orangesjuice. News from the western parts of Costa del Sol. The blue pond. An oasis in the heart of Sierra Bermeja. Lovely streets with great flower decorations. Very nice if click like on our pictures. also often called Costa del Golf. Norwegian football teams on yearly training trip to Estepona. FK Haugesund have travelled to Estepona the last years in february. Strømsgodset IF have also used Estepona as a base when they have been here for pre season training. Eight companies is competing about getting to build the planned athletics arena in Estepona. Swedish online magasine with Costa del Sol news. See pictures and check updates and news. Like and follow us. Fireworks on midnight by Plaza del Reloj. Celebration with the family, music and entertainment. Eat 12 grapes to the midnight bells for luck and happiness in the new year. Just 40 minutes from Estepona, is Gibraltar. Go on the well-known mountain and meet the Gibraltar-monkeys. Go back to Gibraltar centre and have a proper English lunsj, maybe fish'n'chips. Here you will find English shops, English pubs and an English athmosphere. A little bit of England by the Mediterranian. How do you get to Estepona? Gibraltar airport - about 40 minutes to Estepona. It is recommended that you go over to the spanish side and rent a car there because of long lines over the border. Granada airport - about 2 hours on motorway to Estepona. Alicante airport - 550 km to Estepona, about 5 hours. Madrid airport - 600 km to Estepona with mostly motorway, about 5,5 hours. This is the easiest way to get to Estepona. Malaga Airport has many rental companies. These are easily available and have very favorable prices. The bus has some daily departures to and from Estepona. Cheap, fast and efficient. Unfortunately just few departures. There are plenty of taxis ready at Malaga airport. It costs about 85 euros for the trip to Estepona. Today, the train does not go further than Fuengirola. However, it is decided that the train will go all the way to Estepona. The building of the tracks has started.